The days of granite are gone, but it doesn't appear that quartz countertops will lose their appeal. Quartz countertops require less maintenance than granite, and their shimmering surface offers a timeless appeal. Compartmentalized floor plans are out – so, tear down your walls and open up your kitchen to the rest of your house! Open floor plans accommodate a connected and interactive lifestyle. Not only does induction cooking cut down on heat, but they are also safe to the touch – which is perfect if you have children! Producing little heat, these cooktops also remove the need for a range hood and open kitchen design to endless possibilities – like adding the cooktop to the center island. A single-level kitchen island adds valuable countertop space for prep work, while also increasing the functionality and appeal of the kitchen as a whole. The ceiling is often overlooked in the kitchen – but the potential is there. Consider tapping into the endless possibilities for your kitchen ceiling by adding shallow coffers to create a cozy feeling or moldings to help define a larger kitchen space. LED lighting is here for the long haul. These bulbs are not only more efficient and longer-lasting than other options, but they also bring a brighter light to any room of the house. Kitchen storage is oh-so-important – especially with the trend to decrease the number of upper cabinets. In addition to being more accessible, deep drawers, with pegboards, increase the organization and tidiness of any kitchen. Made popular by the farmhouse design trend, open shelving is the perfect way to give overhead storage space a fresh look. Hardwood floors are timeless and aesthetically pleasing. 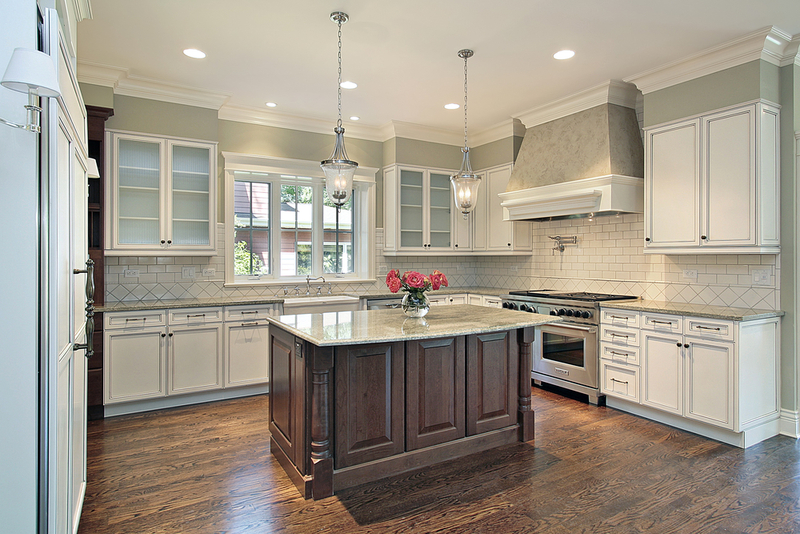 Are you worried hardwood floors will require too much maintenance in the kitchen? Real wood may be too hard to maintain. But, lucky for you, they now have tile that looks exactly like hardwood flooring – visually appealing and less upkeep! Larger sinks accommodate larger pots and pans, and their functionality is better at containing splashes. Add one to your kitchen space to make clean-up a breeze – or easier, at the very least! Designing your kitchen with these in mind will help ensure your kitchen never goes out of style again!